Risk is inherent to finance. Even with insurance, no one is completely risk free. Risk is part of life, regardless of what we do — and that includes investing, as pretty much anyone who lost money in the last few years can tell you. In the last couple of years, gold and silver have been discussed without end on talk radio, financial TV, newspapers, investing blogs — pretty much all media is infatuated with precious metals. Is gold in a bubble? Is silver going to explode? Do precious metals outperform the dollar during times of recessions? Many people say you should buy gold now, while others say you should wait. But if you decide that this is a good time to buy gold, what then? What’s the best way to invest in gold? 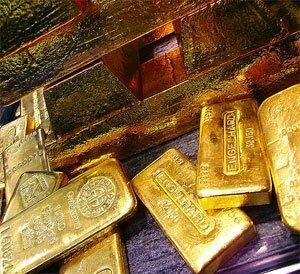 In this post, we’ll be discussing an alternative way to invest in gold that doesn’t include gold futures or physical bullion — and just might include healthy dividend income. Investing in precious metals like gold is an extremely risky financial move. Buying gold at its peak, only to see its value diminish, means you lose your investment rather than gain it. And, given how volatile the price of gold has been in the last twenty years, you could lose over 70% of your investment — or more. If you buy gold at its peak, and it won’t “re-peak” at that point again, then you can’t make money. You’ll never be able to get your money back that you invested. It’s essentially a checkmate. The same goes for silver, platinum, and pretty much every other precious metal in existence. It’s risky. To profit at all, you have to sell your assets after the prices for your metals increases. If the price goes down, you can’t make money. The inherent risk in buying commodities straight up has led investors to look for a more secure and less risky way to invest in rising precious metals costs. Below, I’ll be talking about a way to indirectly invest in gold that is safer. Of course, “safer” in investing is always a relative concept, and you’ll need to do the specific homework on your own. Dividend Investing. Most gold and mining stocks pay dividends. These dividends essentially insure that you won’t lose money necessarily — your assets are paying you. Dividend investing means you can buy and hold with more security and profit. This also means you don’t have to time your exit out of the market – something that will save you headache and heartache down the line. Growth Investing. At the risk of sounding like a pesky “gold bug”, I’m extremely bullish on gold. The reasoning is simple: inflation is coming, according to people like Warren Buffett and Jim Rogers. And even if inflation wasn’t coming, gold production was outstripped by demand just from jewelers. In the last 5 years, jewelry-gold demand has outstripped new gold production by 500 metric tons per year. That’s a lot, and it’s only going to increase as the world population increases. Value Investing. Investing in just physical bullion doesn’t allow you to invest in companies that you know — it makes your ability to pick the “right” company diminished. By investing in gold companies, you’re given one more variable that, if you understand well, can help you profit more in the long term. You can research the gold mining companies and pick the one that makes the most sense. That’s more security and potential profit. Gold stocks, of course, also bring on other risks: accounting fraud, bad management, etc. While I believe investing in dividend paying mining stocks (especially larger companies with a proven track record) is a safer alternative to risky gold futures and physical bullion from a profit-perspective, some would obviously disagree. Mining stocks are my favorite way to invest in precious metals. Of course, that doesn’t mean I don’t own any physical gold. Getting a little physical with gold investments is OK if it’s done in moderation. Physical gold and silver coins are a great “worst-case scenario” investment, and can provide the more cautious investor with some peace of mind. But in the end, investing in metals through mining stocks is my preferred gold investment because it pays dividends, allows one to invest in long-term growth, allows for value investing, and doesn’t decrease one’s ability to profit. Do you think precious metals are going to go up or down? What would bring you to decide that now is a good time to invest in metals? What, in your opinion, is the difference between investing and speculating? @Steve – I think the point is that while the us dollar may be devalued, gold and silver still have worldwide value. You can still buy imports ( food, meds, things to barter with) because your metals will still have value to the countries that are producing the goods. Locally, people will be more likely to sell items for gold or silver because they can use it to buy imports (and local goods). Rinse, repeat. That is a pretty simplified explanation, but hopefully helpful. Oh, not to mention having a currency that allows you to set yourself up in a more stable country doesn’t hurt either. I have a question. This is a hypothetical question. Suppose it is 2015 and for the past two years the USA and the world have experienced the worst financial storm imaginable. The dollar is worth less and almost worthless. Some people are burning it to stay warm. Food lines and despair fill the landscape. I planned ahead. In 2012 before the crash I went 100% into gold and silver when they were priced at $1600 and $31.00 an ounce respectively. Today (2015) gold is worth $10,000 an ounce and siver, needing to rise to the historical correct ratio, is at about $900 per ounce. It is time to cash in. Here is where I need help. Dollars are worthless so why cash in for dollars? I am a multimillionare in dollars but what good is it? What will happen politically or economically that will make my gold the good investment that I thought it was? I can’t eat the gold and it will not keep me warm. Please explain. @Pinyo – Thank you. I am 72 and already retired. I do not want to invest in gold. I would like to move what I have to a safer place. I don’t want to wake up one morning with someone telling me that I have zero. I live within my means but have little to save. I am a lower middle class person with a small (at least it is small now) IRA which is somewhat diversified. I have very little knowledge about investments. That being said and the dollar going down the tubes how does someone like me find out what she should do to save what little I have. The only thing that I have read or been told is to buy gold but to be careful and watch the ups and downs. Also there are so many ways to buy gold, how do you know which is best for you. Is there an alternative to gold or metals or is that the only salvation. I hope this doesn’t sound too dumb. @Susan – Regardless of the economic situation, it’s hard to go wrong by living within your mean and save money. As for investing, for someone just starting out and have little to invest, I would suggest looking into target retirement funds from Vanguard. They have low fee, good management, and well diversified. As far as gold, I would not invest more than 5% of my total portfolio in this asset class. If you want to get a start in gold, ETF is probably a good place to start. BEWARE ETFs. Do a google search on- are ETFs a fraud silver- What you will find is that iShares SLV and others could not possibly be buying the physical silver they claim. They must be cooking the books. Info has leaked recently that many ETFs have been buying treasuries instead of the requisite commodities. The FED and huge banking interests are desperate and the country is insolvent like Greece, Ireland, Iceland, etc. I have done very well in gold and silver ETFs over the past few years but am dumping them for mining stocks. I learned something from the Bernie Madoff affair- the SEC WILL NOT protect you. They were tipped off years before but failed to act. I still think that physical metal is the best and most secure investment. Physical metal will never go bankrupt, while other derivatives, like mining stocks can. Thanks for the article. * Do you think precious metals are going to go up or down? – Not familiar with this industry… But there seems to be a lot of hype regarding this. * What would bring you to decide that now is a good time to invest in metals? – I would rather not invest on something I don’t understand… Yet. * What, in your opinion, is the difference between investing and speculating? – Investing is being able to do a background check. You read about a company, the company’s financial statement, the company’s management, before you invest. Speculating is just doing what other people say, or basing your judgment on what you heard about. I agree, Kevin — that advice is probably true for almost all investments. It depends on how broad of a definition you give to “chasing”. 😉 When I say chasing, I’m thinking of someone that is constantly buying and selling, and often at the wrong times. They see something go up, so they buy in at high prices, hoping to continue to ride the wave upwards. When something starts falling, they sell. If not done with a proper strategy in place, this sort of behavior could lead to subpar returns, as our investor ends up buying too often when prices are high, and selling too often when prices are low! I agree that an ETF can sometimes be a method of speculating on the price of gold, but I’m extremely cautious of physical bullion ETFs… there are almost always multiple layers of accounting, and it might not always be as physical as suggested. Of course, I might just be extra paranoid. Technically, all investing is “chasing” returns. It’s just a question of how we “chase” that matters, and whether our strategy is safe enough. Dividend investing really is a great tool for investors. The Dividend investing and the ETF are the best ways to do it. The well-established and time-tested gold stocks are probably ok to invest in, but mining for a long time has been an area where there are plenty of con artists at work. You could always just do like George Soros and John Paulson and buy a physical gold ETF like GLD or IAU. That is the cheapest way to own physical gold.